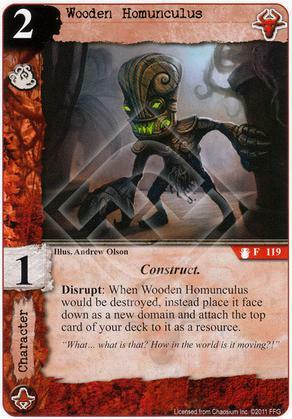 Disrupt: When Wooden Homunculus would be destroyed, instead place it face down as a new domain and attach the top card of your deck to it as a resource. Flavor Text: "What... what is that? How in the world is it moving?!" The term for dying by getting wounded to much is destroy. So, about this guy... how does his ability work? If you wound him to pay for Pervasive Toxemia, can you now commit to stories, or does the replacement effect keep PT from being paid? My guess is the "debt" has been paid, and I'm free to commit to stories at that point because, in order for the Homunculus's destruction to be replaced, the wound would've needed to be applied. The wound comes first; the resulting destruction is what's replaced. Is this right? If not, I need to take the Homunculus out of my deck and find someone to go in his place. Thank you! This is a tough one, I may need to consult with local elders to form a sound opinion but you have my tentative agreement. On the surface, it appears the disrupt triggers before the wound is applied, this would mean you haven't paid the cost. But I don't think that is what happens. The use of "instead" makes this a "replacement effect", but for what? It could be readily argued you are replacing the whole "take a wound and die" package. In this case, you would again not have ever dealt the wound and could not commit. But, I think it is probably for the destruction process itself (since it sort of names it), and this means the wound must have been dealt - it just had a non-standard effect. It follows that you have paid the cost and can do your commit. I favor this last interpretation, but am not nearly as sure as I would like to be. I will ask around and if I gain any wisdom will get back to you. That was my interpretation as well. Thank you, RP. Much appreciated.